Modern day mammas don’t stand on the sidelines. They’ve created something truly amazing in response to an old hat selfie trend. Now #brelfie (breastfeeding selfies) photos are all over the internet turning it into the art gallery! And here’s why. These #brelfies are not usual photos. Well, initially they are, but in the end (after some «magic» done in a special app) they look worthy of some posh galleries. Ever wanted to be an artist? Good news for you. Now you can be one 😉 Thanks to the new PicsArt app for editing photos. The creative community of this app supports #normalizebreastfeeding campaign (i.e. mothers posting a touching breastfeeding picture in social media illustrating deep roots of love and care to their children) by providing tools like «Tree of Life» to encourage this beautiful mother’s movement. 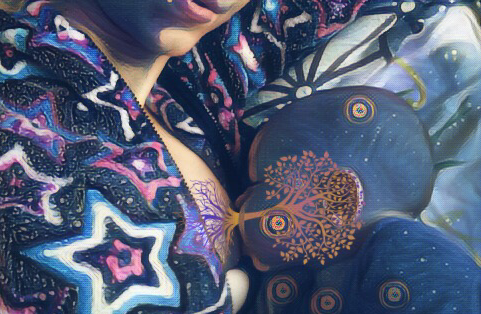 The #treeoflife embodies both psychological and physical connection between you and your baby that literally gives him life, food, protection and comfort through breast milk. I was so amazed by the stunning beauty of these brelfies all over instagram that I just couldn’t help making one, too. Why normalize breastfeeding? Isn’t it already normal?.. I was raised on formula. My mom always told me that she had troubles with milk at the start of breastfeeding and decided to switch to the formula. Not so long ago she confessed that she just hadn’t tried hard enough to safe her breast milk and establish lactation. And you know why? She said, main reason was lack of information! She didn’t know how does milk production work, neither did she know what to do to increase breast milk production. She thought she always didn’t have enough milk for me and I was hungry, so she gave me formula. First it was just once a day, but in a month it turned into the full substitution and her breast milk was lost. It’s a very sad story, actually. I’m not sure that even nowadays every mother knows: breastfeeding is a “use it or lose it” process. You have to nurse more frequently and watch for the right latch on to get more milk. So why breastfeeding is a big deal for me? It’s because I don’t want to loose this connection between me and my baby. I want us to really bond. I want him to get every benefit he can from my breast milk. I want to be able to comfort him whenever he’s hurt or sick or just sad. I want to breastfeed because there’s nothing more natural and beautiful than that! And I stand for normalizing breastfeeding! I stand for nursing in public without shame. I stand for speaking about it, sharing, being proud of the fact that you breastfeed! And if you follow my philosophy, tell the World why you breastfeed. Because we mamas have to hold together. Because as long as we speak about breastfeeding out loud, there will always be knowledge. There will always be enough information for women eager to breastfeed but having difficulties on their way to established lactation. Like my mother had.